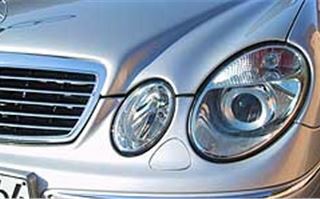 Mercedes Benz used to run a tag line, “engineered like no other car in the World”. Then the cost accountants got to work. And, though the MB image still stuck, the products did not really live up to it. Now the company is returning to its core values. Because though the new W211 Mercedes E Class looks a bit like the old one, everything about it apart from the engines and transmissions is entirely new. And it is built like no other car in the World. Safety engineer Thomas Remmen proudly showed me around a cutaway body, which is the closest most of us will get to appreciating what has gone into it. For example, the B pillars between the front and rear doors aren’t just box sections. They are box sections inside box sections. And inside the double-skinned pillars are tubes of Boron alloy steel. The sills, too, are double-skinned, with strengthening pieces inside them, backed up by crossmembers under the seats. If something crashes into the side of a new E Class it’s going to have to do so very hard indeed to intrude into the cabin. And even if it does, the driver and passenger will be pushed across the car out of harm's way on their integrated seats surrounded by side head airbags and side curtain airbags. In a frontal impact, sacrificial crush boxes extending about a foot protect the engine compartment. Between them and the scuttle, massive box sections containing a triangulated tubular steel frame resist any further deformation. 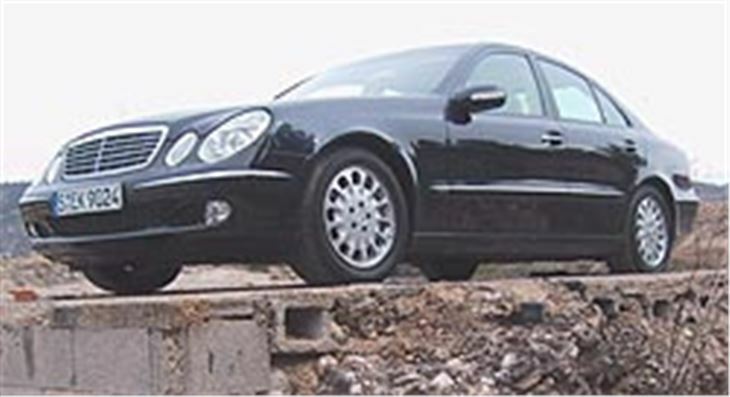 Even the sections behind the front wheels are massively reinforced to prevent the wheels being pushed back into the passenger compartment. And both driver and passenger are protected by intelligent dual-stage airbags, which inflate less violently for small impacts than for large ones. Rear passengers are equally well defended by a progressively deforming (and huge) 540 litre luggage compartment which looked to me even bigger than that of the S Class. Yet the incredible strength and complexity of the structure, which is fully expected to achieve five NCAP stars (NCAP’s top crash safety rating), has not been achieved at the expense of massive added weight. 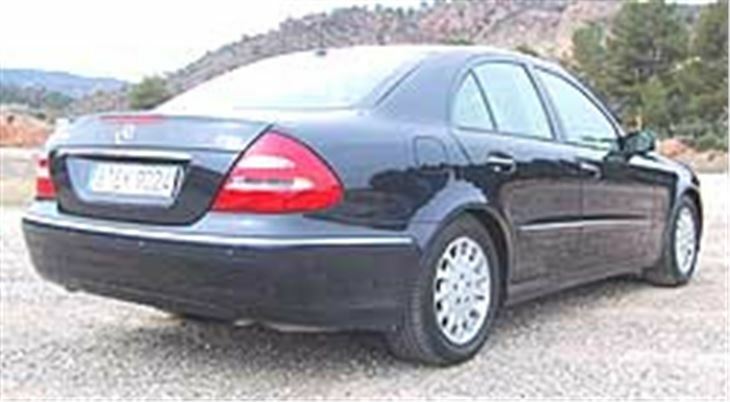 The new W211 E Class weights virtually the same as the outgoing W210 E Class, largely due to extensive use of aluminium pressings for the bonnet, front wings, rear parcel shelf and boot lid. 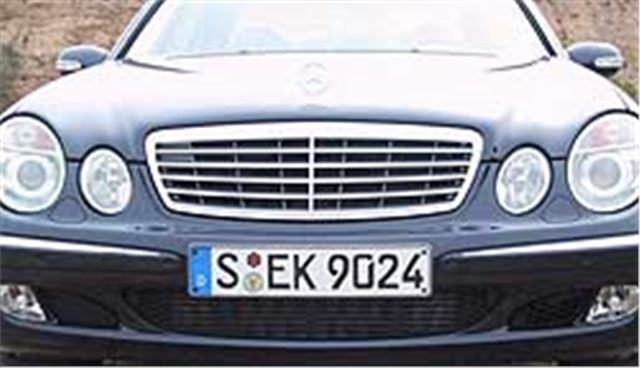 The other advantage, of course, is there’s no way the new car’s bootlid is going to start rusting around its number-plate as was sometimes the case with early examples of the W210 E Class. In a mercifully short presentation, MB engineers took us up to speed with the car’s many other advances. 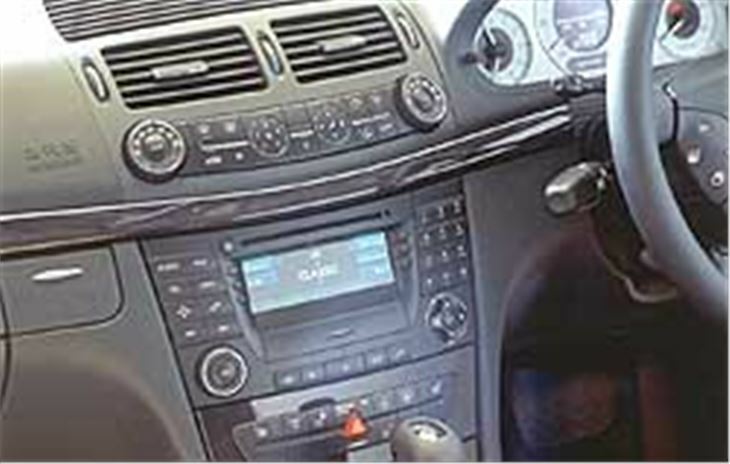 Optional AIRMATIC Suspension allows the driver to select either soft or two levels of sporty ride and also provides more steering feedback. Optional Dynamic Multicontour seats have a lumbar pulse to give you a an occasional massage at the base of your spine, which any osteopath will tell you is the best thing that could happen to it on a long journey. The sides of these seats also fall back flat or wrap themselves around you, adapting to your shape at the touch of a button. They are the most comfortable seats I have ever driven on, bar none. The new optional new THERMOTRONIC air conditioning allows each of four front and rear seat passengers to select and maintain their own individual climate zones. And, if you specify the panoramic glass roof option (at £1,200) when you leave the car, a solar-powered fan circulates air through the upper part of the cabin to keep it as cool as possible without draining the battery. Most importantly, while not intruding on driving pleasure, the combination of ABS with Brake Assist, Sensotronic Brake Control and Electronic Stability Programme make this car extremely difficult to crash. So what’s this paragon or engineering excellence like to drive? In a word, brilliant. Obviously, some models are better than others and a fully optioned-up E500 is a rather different animal from a Classic spec E220CDI six-speed. They are all damn good cars, only some are more damn good than others. 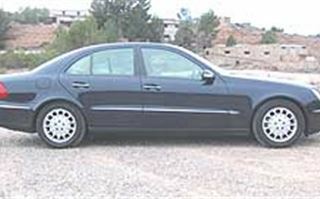 A high-spec E270CDI 5-speed automatic with optional AIRMATIC suspension and Dynamic seats was the first car we tried. It handled magnificently on the twisting smooth-surfaced roads inland of Valencia, had a wonderfully responsive manual override to the box, and enough poke to see 200kph a few times on the two lane blacktops, but it didn’t quite have the punch of the same engine in the lighter C Class (see C Class Estate Road Test). Next, the E320 petrol V6 with the same 5-speed automatic transmission and kit level. Unlike the C Class, I’d say this was definitely the nicer of the two to drive; plenty quick enough with more revs to play with and a top speed artificially limited to 155mph. Now this is a very high top speed for a substantial 1,645 kg car with just 224bhp. After all, the slightly lighter 1,628kg S Type Jaguar 3.0 V6 with 240bhp will only pull 145mph even with a manual gearbox. 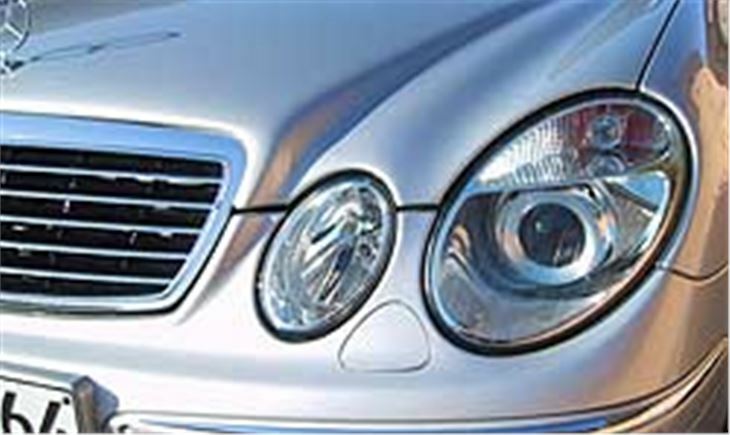 The reason why the Merc goes so much faster is its very aerodynamic Cd 26 shape with smooth undertrays to prevent vortexes forming beneath the car. And, of course, if you don't want to go so fast, the benefit is significantly better economy. 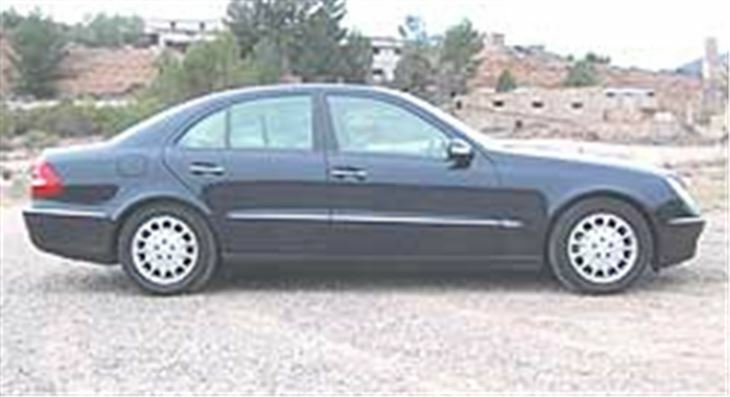 Number three on the list was an E240 V6 automatic. A nice car, just a bit sweeter then the E320 with plenty enough power for most people. We also tried a six-speed manual of the same model without any extras and it, too, was fine and smooth if you like manuals, cruising happily at a natural gait of around 150kph with 25mph per 1,000 rpm in 5th. (This combination won’t be coming to the UK.) Oddly, the official mpg figure for the E240 6-speed manual is worse than for the automatic, and both are worse than for the E320 automatic. 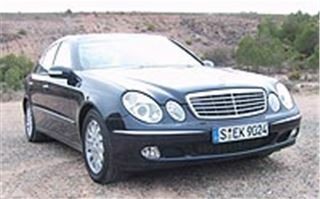 But finally, the car that spoils you for any other E Class: the E500. This is almost awesome, combining very nearly the wallop of a Porsche (0 – 60 in 5.8 seconds, and 164mph in the unlimited version) with superb, utterly viceless, totally foolproof handling and roadholding together with the limo-like attributes you expect from a Merc. Make a mistake, whack this car too fast into a corner that tightens up on you, and a quick dab of the brakes solves the problem. You think you’re driving fantastically, but the truth is that the ABS, SBS and ESP are so unobtrusive, they does the job for you without you even noticing. 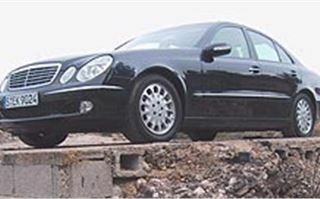 Having tried the E500 again in right hand drive on UK roads I can confirm that this is the best, most confidence inspiring high-performance 5-seater saloon car money can buy, bar none. Its only possible competitor can be the forthcoming 476bhp E55 AMG, which promises steering wheel push-button gearchange, a 0-60 of 4.5 seconds and a top speed approaching 200mph with the limiter disconnected. Even if you’re rich as Croesus, it’s the only car you will ever really need. The Ferraris, Porsches, Range Rover, Mercedes SL55AMG, Evo V and WRX you bought to impress will end up mouldering in your motorhouse because this is the car you will naturally choose to drive every day. 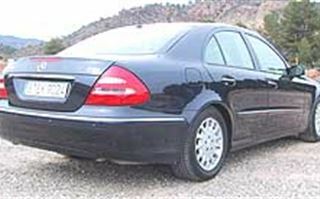 The UK launch in June 2002 also gave me a chance to catch up with the E220CDI automatic which, besides being a very competent, very complete and very satisfying car in its own right, has to be the ultimate private hire taxi. Despite just 2.2 litres and 150bhp, it has a whopping 251 lb ft torque, which is more than enough to bowl along very pleasantly indeed with more than enough grunt in hand for most people. So that’s it for now. There will be a new supercharged 163bhp 1,795cc four along soon to power the E200K, a six cylinder 320CDI diesel and the awesome E55 AMG by the end of the year and, of course, estate cars next year. But the main thing about the new E Class is that it will restore your faith in Mercedes brand. There is no other saloon car quite like it. It really is “engineered like no other car in the World”.